Last February during the Buyers Market of American Craft show in Philadelphia I met a nice lady who talked about an upcoming Trunk Show at the Katonah Museum of Art in New York. She asked if I might be interested in sending things for her to sell on consignment. It worked out! I sent two boxes of assorted fiber arts to her late last week. Inside were several, smaller Grave Rubbing Art Quilts, various shrink-wrapped pieces of fiber arts, a few framed keys on embellished grounds, fiber Christmas ornaments and about seventy of my wrapped and stitched wooden spools. I put the ornaments into a fiber vessel. I put the spools into another fiber vessel. I put price tags on the vessels just because they were being sent in the box. Well, yesterday the nice lady received the boxes and immediately sold the two vessels. The trunk show isn't even until this coming Saturday and Sunday. She called asking for more vessels and also for some sort of explanation as to how these pieces are stitched. Yesterday Steve and I packaged up 28 vessels and got the box to FedEx before the last pick-up. So ... today I'm posting my "explanation". Here it is! 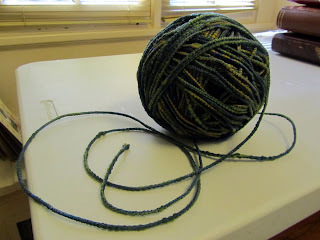 I started making fiber vessels years ago after a hair-brained idea occurred when looking at a giant stash of knitting yarn acquired at a local auction house. Since I don’t knit and never even learned to crochet, it seemed a shame to waste all that acrylic yarn. I thought to myself, “Maybe it could be stitched into something?” So, I shoved six to eight strands of yarn through the # 21 Braiding/cording foot of my Bernina. Using old threads also bought at auction, I zigzag stitched over the strands of yarn to create a thick cord. When I ran out of a yarn, I substituted another. When I ran out of a thread, I substituted another. It was fun and a great way to use neglected materials. 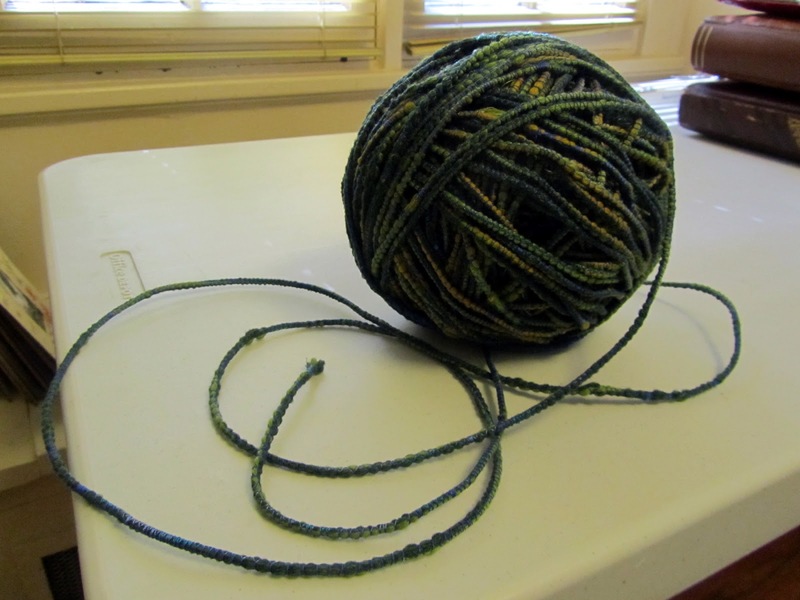 I continued zigzag stitching over the yarns until a relatively large ball of cording was made. I really had no idea that the stitching would automatically start shaping itself into a vessel but it did. After creating a dozen or more, I got familiar with the process and was able to control the shape. Below is a description of how I now stitch these pieces. First, take the end of the cord in your fingers. Create a flat, relatively tight coil about the size of a quarter. 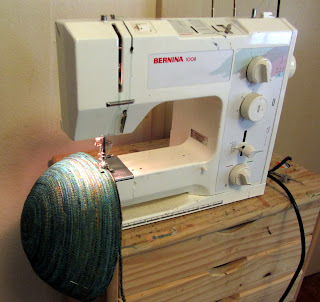 It is easier to take a needle and thread and hand-stitch/baste the coil … though eventually, I became quite able to do this by machine as well. 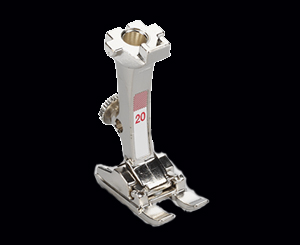 Position this coil under an “Open Embroidery” sewing machine foot … with the cord coming off the coil on the right side of the machine’s foot. 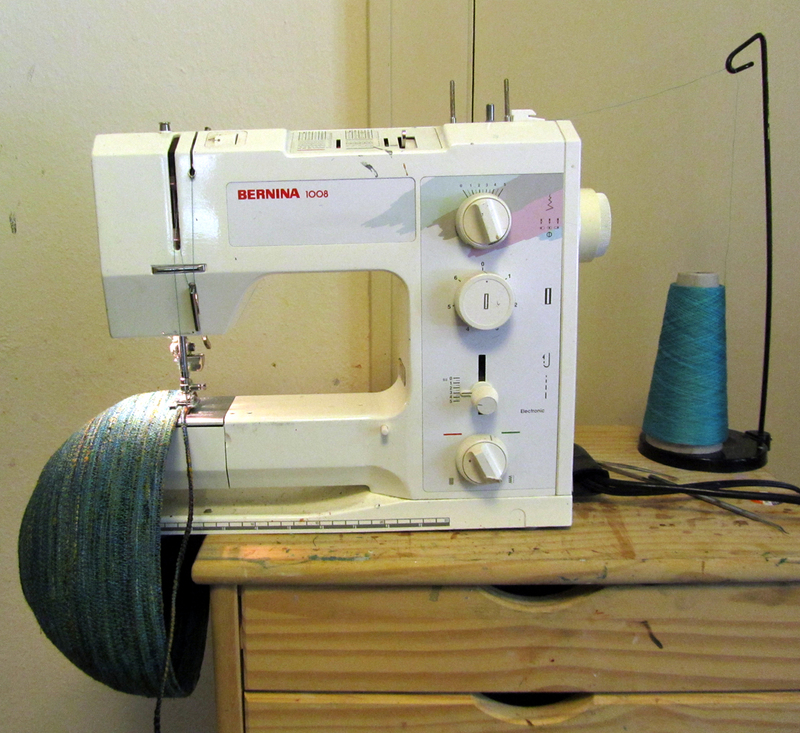 On my Bernina, this is the #20 foot. 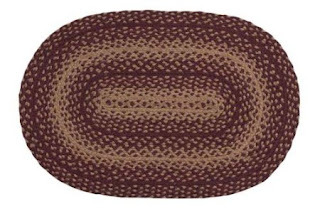 The idea is just like the braided rug above … a cord is zigzag stitched in a flat spiral … growing bigger and bigger. Stitch … cord to coil … in an ever-continuing circle. As the coil grows larger than the machine’s base, it will start forming a vessel by itself. I generally don’t use my slide-on or plastic extension-table … just the machine. Keep stitching. This is how it looks … cord being zigzagged to the ever-growing coil/vessel. Eventually, the coil forms a vessel. With practice, I became quite able to control the formation. I don’t know any easy way to articulate the feel, motions, and process of forming this shape except to say … TRY IT! 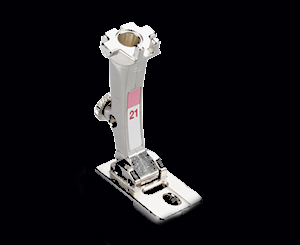 As the shape gets larger, it is often necessary to move the machine slightly off its support table. This allows the vessel to rotate in a perfect circle … like a very, very slow potter’s wheel! 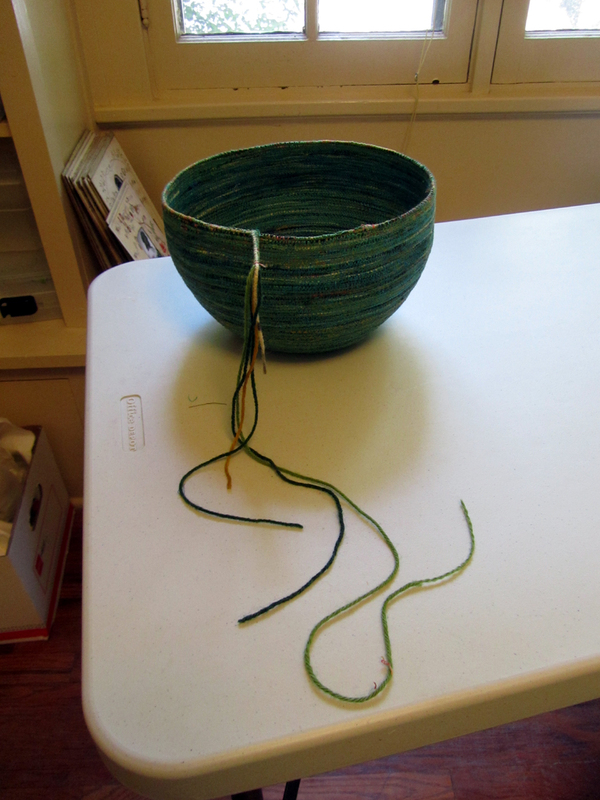 When I’m satisfied with the vessel and want to stop stitching, I cut the cord about two feet away from the vessel. Using a seam ripper, I separate the yarns and snip them at various lengths. This prevents a “bump” on the rim of the vessel. 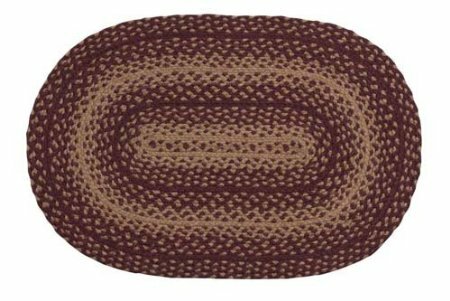 It allows the cord to become thinner and thinner until a smooth rim is achieved. 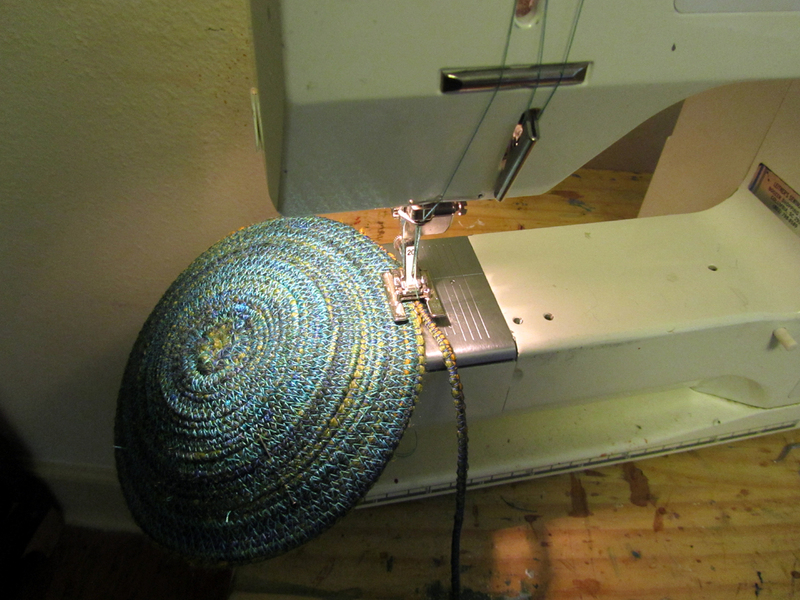 I put the vessel back under the #20 foot and continue zigzag stitching until the last, single length of yarn is attached. 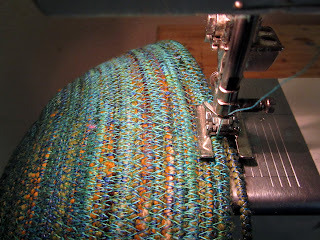 By the way ... though I've had a very busy week, I haven't yet blogged about it ... so this is the post being linked to Nina-Marie's "Off the Wall Fridays", a site sharing fiber artworks. Brilliant! I've just learnt how to make coiled fabric pots with a washing line core, but I must try this too. We stitched the other way out ie the stitching was in the inside of the bowl, and it curved upwards. You can then hold it around the top of the machine instead of round the table! This is an amazing idea! Clothesline is so dense, I have to use my industrial machine. But this! Beautiful, thrifty, interesting, no bulk, and fun!! Thank you!! Must take absolutely ages though!